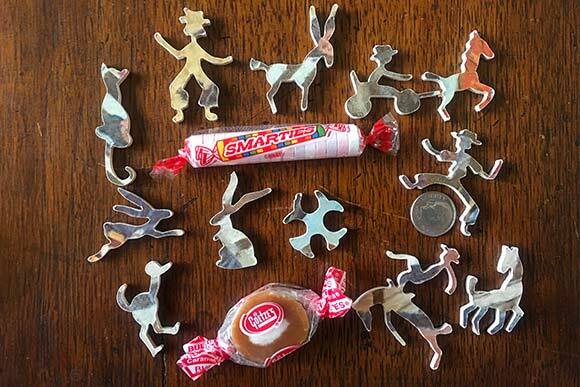 "It's time I gave them away," said my Aunt Carol when she handed me a collection of jigsaw puzzles. Making me the recipient made sense as the two of us are the main jigsaw puzzlers in the family. The stack of boxes included vintage Springboks and a Dubl Thik Picture Puzzle along with one claiming to be the "World's Most Difficult Jigsaw Puzzle." But it was the two wood puzzles that captivated me. The first collection of intricate plywood pieces featured rodeo clowns and a bevy of bucking broncos bellied up amid a menagerie of tiny roadrunners, rabbits, goats and donkeys. One cowboy was so minuscule, his horse would have to be the size of a dime. 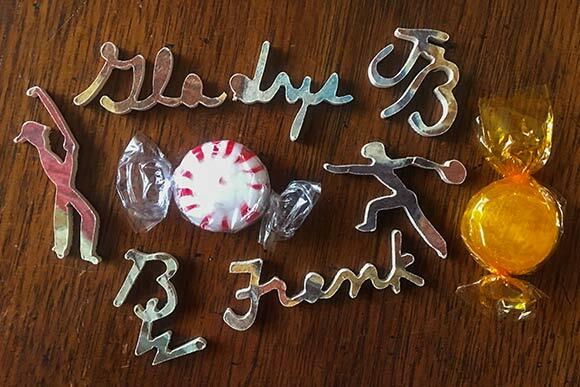 Also, there were two names spelled out in cursive: Gladys and Frank. The other puzzle contained shapes worthy of ornate crop circles and inscrutable hieroglyphics surrounded by would-be frogs and spiders and flowers — most of them smaller than an average thumbprint. These were figures imagined by some oracle — or maybe a good witch. Aunt Carol had had the two wood puzzles for so long, she'd forgotten how she came to own them untold decades ago. They certainly predated today's laser cut wooden puzzles. Hence there was no doubt: these were hand cut. I inflated with wonder and curiosity over who had the skill to create such beautiful and whimsical objects. I set about putting them together and discovered both puzzles were complete. One measured 8" by 12" and depicted a tranquil oriental bridge. The other, not surprisingly, was a rodeo scene, measuring a little more than 10" by 16". Even with the puzzles constructed, I was left with a complete mystery regarding their origin. They had no original boxes or identifying marks. So I did what any good puzzle nerd would do. I consulted America's two foremost jigsaw puzzle experts: Ann Williams and Bob Armstrong. Armstrong got back to me first, telling me to contact Williams, who wrote shortly thereafter, expounding on the rodeo puzzle. "The 'RD' piece in the lower right and your area code make me 99 percent sure it was made by Ruth Dennis, who cut puzzles in the Cleveland area in the 1950s and early 1960s," wrote Williams. "She and Helen Cole had a small jigsaw puzzle business at that time and were written up in the Plain Dealer in 1961." I was floored — Aunt Carol hadn't lived in Northeast Ohio for more than 50 years. So the 'RD' was Ruth Dennis's way of signing her work. I later surmised that the 'hcc' piece in the corner of the Oriental puzzle was Helen Cole's signature. It seemed pretty clear that I had two complete puzzles: one from each of this Cleveland puzzle team. Per the September 10, 1961 article by Rita Vail for Plain Dealer Magazine: the ladies, both of whom studied at the Cleveland Institute of Art, crafted the puzzles from images taken from books, calendars and posters. Each had their own scroll saw, possibly a Delta or a Rockwell Homecraft model. Dennis lived in Shaker Heights and had also studied at Scripps College in California. Cole lived in Cleveland Heights. Both women were active advocates for the Amasa Stone House. "They've devised drawstring burlap bags, hand-dyed in varied colors, for storing the puzzles. The burlap comes from a feed mill near Miss Cole's summer home in Chardon," said the article. Aha! The reason I didn't have any boxes was because there were no boxes. 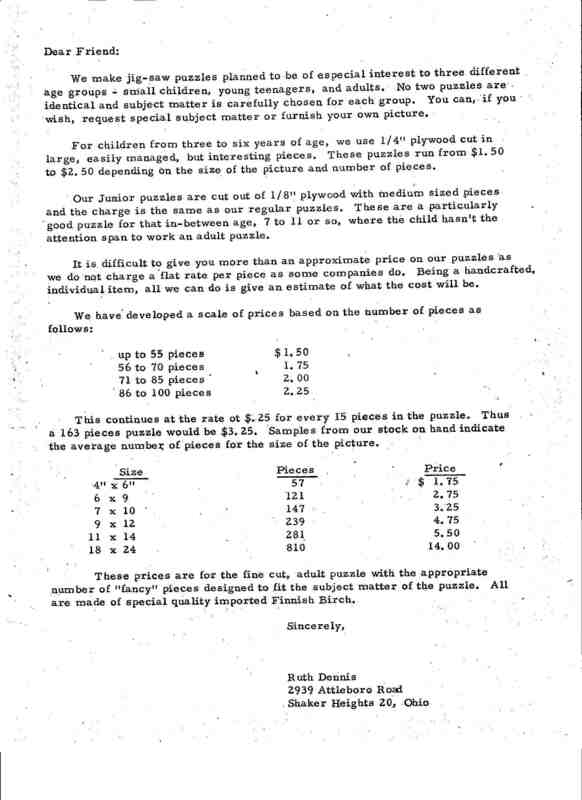 View Ruth Dennis's puzzle price and information sheet. Puzzle guru Williams added one other thing in our email exchange: Ruth Dennis's niece and her husband had vivid recollections of Aunt Ruthie — and they were living in Michigan. When I finally got around to chatting with Alan and Sally Wisnieski, I discovered how much the Plain Dealer article had left out. Ruth Dennis was one of seven siblings who hailed from Coshocton, Ohio, in a family whose roots were formally traced to the Mayflower. She created her intricately detailed puzzles despite a challenging eye condition she'd had since childhood. 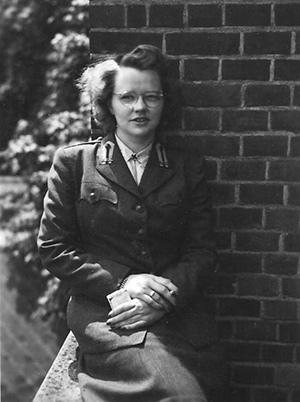 In 1941, Ruth Dennis joined the Women's Army Auxiliary Corps (WAAC) and traveled overseas during World War II to serve with the Red Cross. She spent time in the Pacific and Germany, where she acquired a poodle named Xmas. Lt. Richard DennisHer brother Richard Dennis also joined the war effort in '41. The Purple Heart and Silver Star recipient was credited for shooting down three enemy planes in the Pacific. 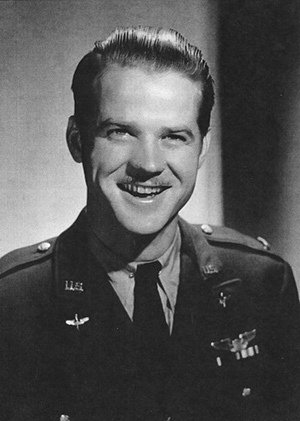 On Dec. 18, 1942, Richard Dennis went missing near New Guinea at the age of 22 and was subsequently awarded the Distinguished Flying Cross, which was bestowed on account of his "fearless service to his aerial combat organization, his fellow American airmen, his country and his home," said Gen. George C. Kenny, commander of the Southwest Pacific Air Force, per the March 9, 1943 Plain Dealer. Ruth returned to the states about a year after her brother went MIA and moved into the maid's quarters of her parents' spacious Shaker Heights home on Attleboro Road. She married once and divorced during a time when such developments were socially wrought. The split filled her with sadness. She never remarried or had children, but she was fun loving with the ready-made kids in her family. "When I was 16," recalls Sally, "she took my two sisters, my cousin and me on a camping trip out west. We drove in a station wagon and pitched tents. We road mules down the Grand Canyon. When Ruth Dennis didn't sign her puzzles with an RD, she'd include a piece shaped like her poodle Xmas or the thick eyeglasses she wore. She did trace the whimsy pieces on the back of the plywood. She cut all the others free hand. By way of quality control, her mom worked every completed puzzle in order to rid it of sawdust and to assure that prior to shipment, they "had been done and had the approval of my grandma," says Sally, who also recalls the scene in the Attleboro Road basement where Helen Cole would sometimes join Ruth and make puzzles. "There would be a lot of conversation and just a lot of good camaraderie going on while they worked," says Sally, adding that Aunt Ruthie was a duplicate Bridge master and an accomplished craftswoman in any number of applications, including needlework and knitting. The family estimates Aunt Ruthie cut at least 100 puzzles and perhaps more than 200. 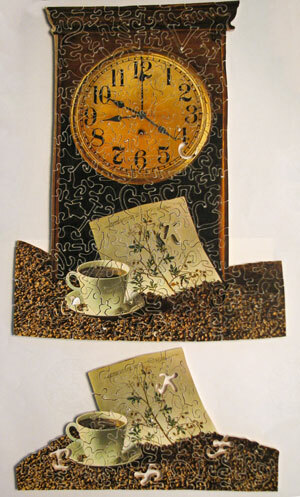 Alan and Sally Wisnieski have a handful of her puzzles, including one that recalls Alan's days in the Air Force flying a C-130 Hercules cargo plane in and out of Vietnam, with whimsy pieces to match. "She made me one for my birthday," recalls Alan. "I was in the Air Force at the time so the picture was of an old DC3 and all the pieces had an Air Force theme with planes and flagmen and of course all the little bird-like figures. One was shaped like an eagle — like a 'bird colonel.'" Yet another piece spelled out "Happy Birthday" in cursive. "Because she was familiar with military life," adds Sally, "she could personalize it quite well." Her puzzles went far beyond military themes. For Alan's parents, for instance, who owned Independence Ford on Route 21, the puzzle featured a Model T and pieces shaped like little autos. Alan's father and grandfather both served as mayors of Independence, which was also home to my own family's farm. And when I study my RD/rodeo puzzle, I wonder if Gladys and Frank were bowlers or golfers on top of being rodeo fans; and if the "BW" and "JB" pieces represented their children. I wonder if the puzzle was a gift from Ruth directly or if a friend of the couple purchased it for them. I wonder how this and the Helen Cole puzzle were united and how they found their way to my Aunt Carol. I wonder how the ladies felt as they zipped the plywood through the craft saws and which puzzles were their favorites. Clearly, the intricate pieces say much about both women. I wonder about their friendship. Did they ever eat lunch at the Theatrical together, ride in streetcars or attend fashion shows at Higbees? I wonder if Ruth Dennis baked cakes or preferred to buy them from Hough Bakery. What did she and the girls giggle over in that station wagon as they drove from Ohio to Arizona in 1958? Were their dashing men in her life? I wonder about what made her laugh and what made her cry. I wonder about the moment Ruth Dennis learned her brother was MIA and how she felt as she served for months thereafter. How long did her brother's last moments over the dense New Guinea jungle haunt her? Perhaps until February 1972 when she died at the age of 52. "She was really a wonderful person," says Alan. "She was just delightful. She brought a lot of joy to a lot of people."